Captain Derrick Cogburn aboard S/V Transcend. 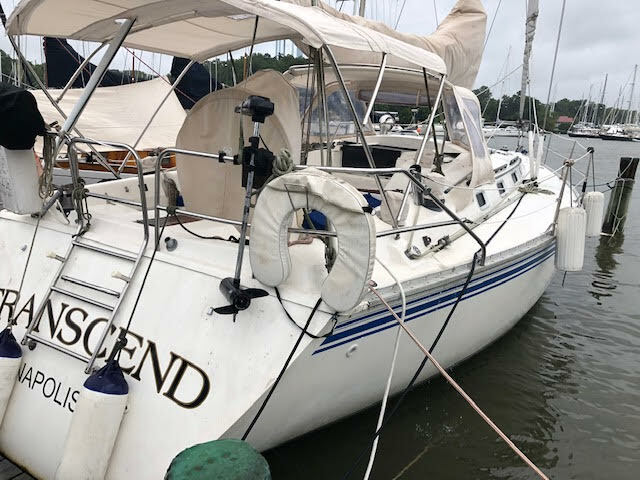 S/V Transcend, A Hunter Legend 40.
and he is starting a Sea Scout Ship in the Annapolis, MD area, number 1959, name of “Commitment.” Think of it like a Boy Scout troop, only with a nautical focus. In our chat we talk about how they came to own the new boat, sell the old one, plans for the future, being part of the Universal Sailing Club, the Seafarers Yacht Club, Seafarers Foundation, the Sea Scouts program, and the benefits of going to seminars at the Annapolis Sailboat Show.